Ok so I’ll make this one quick. These are just like regular shortbread cookies, except you replace half the amount of butter with melted chocolate and add some broken nuts as well. Using the double boiler method, melt the chocolate in a bowl and set aside. 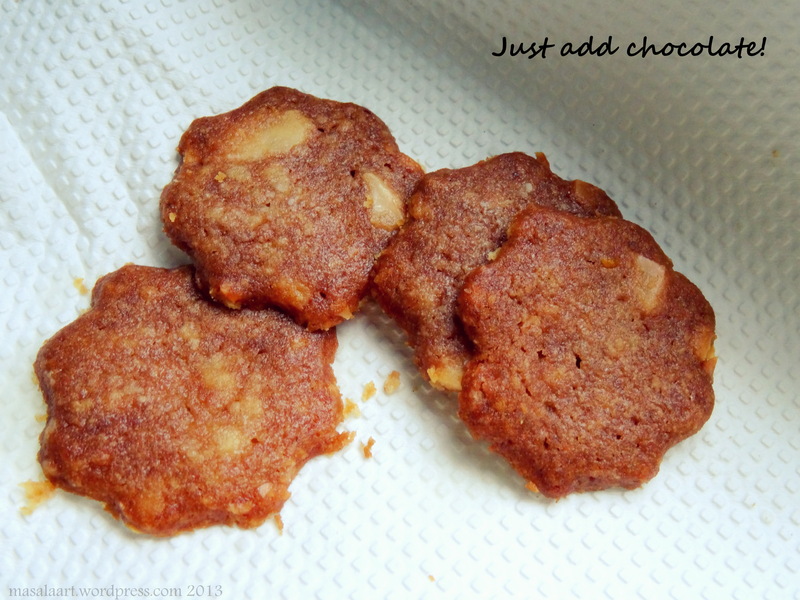 Fold in the flour little by little and mix until the mixture becomes crumbly. Fold in the chocolate and broken almonds until a uniform dough is formed. Shape the dough into a ball, press down into a thick disc, wrap in cling film/plastic wrap and chill in the refrigerator for at least one hour. This dough may be stickier because of the chocolate, so make sure it rests really well. Cut into shapes using a cookie cutter. Bake at 180C for 10-15 minutes; or until the edges appear crisp. OMG I think I need to make these tonight! They look so amazing! I think I’ll use some dark chocolate and lots and lots of almonds. Yum!